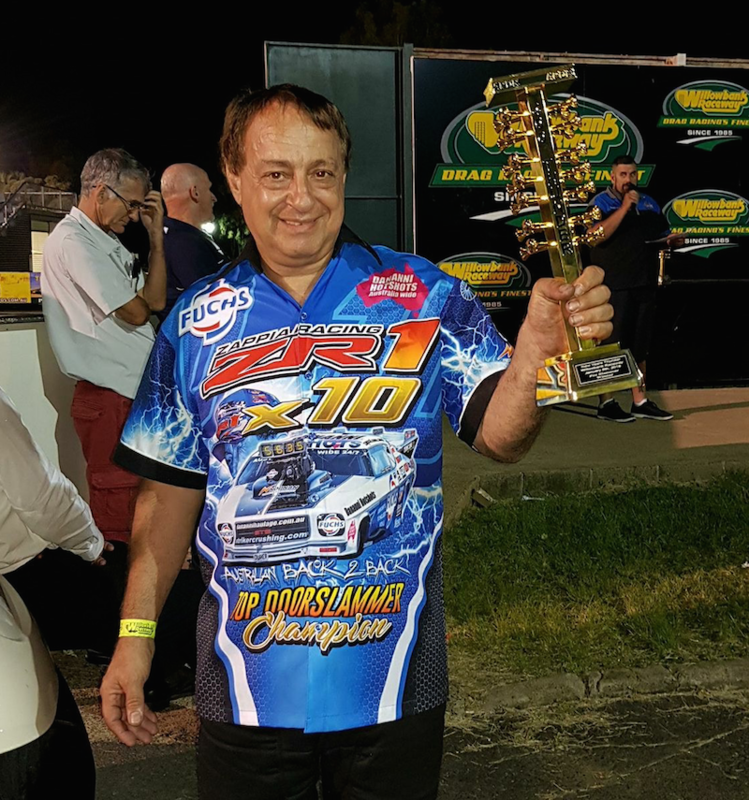 John Zappia has returned to the top of the 400 Thunder Pro Slammer series with a textbook performance at Willowbank Raceway’s New Years Thunder event. As hot temperatures scorched the track surface during the day, Zappia chose to keep the Fuchs/Dananni Hotshots Monaro and his hard working team under cover during the optional test session before emerging for a first round confrontation against Queensland local Russell Pavey. 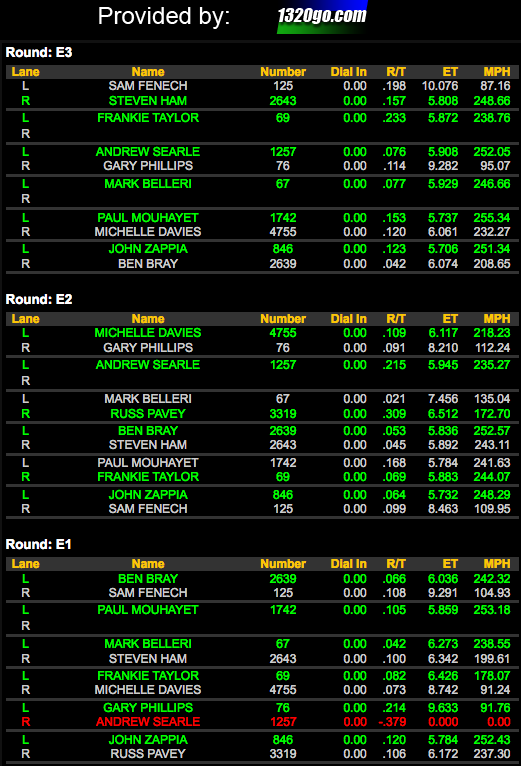 Zappia clinched his first win of the night with a 5.78/251mph run to defeat Pavey’s solid 6.17/237mph in his 63 Corvette. Sam Fenech’s App Shop Camaro would be the next target for Zappia as the second round loomed. With the two quickest elapsed times of the night and two win lights, Zappia was perhaps a favourite on paper for the final round, but would face Queensland’s hometown hero Ben Bray for another epic match up. “Ben put a good holeshot on me but we made up the difference between 330 feet and half track to come past him for our quickest run of the day at 5.70/251mph. Ben threw the blower belt off his Corvette, but even if it stayed on we had him covered. “It was a flawless performance from my crew and everyone involved with our team. We got the win with three great runs and reclaimed the championship lead.The Noonan engine also performed flawlessly and thanks to the quality of the Fuchs Lubricants we had no maintenance and the engine looked brand new. Zappia said he enjoyed the one day format, with spectators showing their support. “I think the one day thing suits us. While it is a long way to travel for us for a single day, we generally can come out and run a low 5.7 or 5.6 off the trailer. The New Years Thunder win followed on from another victory by Zappia in the Direct Mining and Industrial Summer Slam at Perth Motorplex on December 2, where he defeated Kelvin Lyle – who runs a Zappia Racing engine combination – in a crowd pleasing 5.71 to 5.77 final round. Zappia Racing are proud to announce they have welcomed a new sponsor to the fold with Boninfante Friction joining the many performance partners on the team. 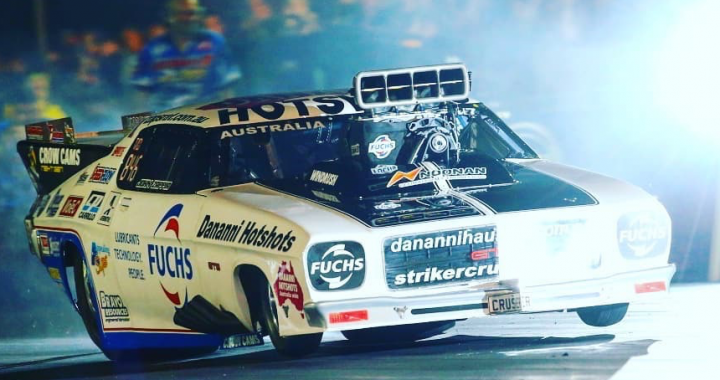 The Fuchs/Dananni Hotshots Monaro will next head to Sydney Dragway for Santo’s Summer Thunder on January 20 where Zappia will aim to extend his championship lead. 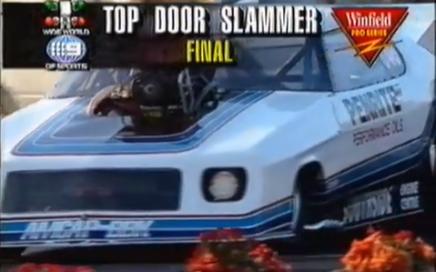 Nostalia Moment One of the most memorable Top Doorslammer races of all time – in front of 55,000 people, John Zappia takes out the final from Brendan McSweeney by “mowing the grass” at Calder.